In 2018 Sydney Catholic Schools collected money and created social justice projects to support the Gift of Goodness campaign. Here are the top performing Sydney Catholic Primary Schools, Colleges and Independent Schools! Click here to complete a short survey to provide your feedback on the 2018 campaign and provide your 2019 resources requirements. Family Educators… we need your help! Make an appointment with your Religious Education Coodinator or Social Justice committee to discuss how the Gift of Goodness Campaign can be extended beyond the classroom. Encourage your parish priest to dedicate a mass to Gift of Goodness. Present the Gift of Goodness campaign to your Parents and Friends executive and ask them to support it. Reach out to a community group and encourage them to support the campaign. Pass a collections basket around at the beginning of the school concert and set a Gift of Goodness fundraising target. At the end of the concert announce the results. Promote the Gift of Goodness campaign to philanthropic businesses or individuals in your community. Encourage people to donate at their local Harris Farm Markets when they’re shopping. Click here to view the location of all Harris Farm stores. Family Educators are welcome to organise a presentation from our Gift of Goodness Ambassadors in your school or community. 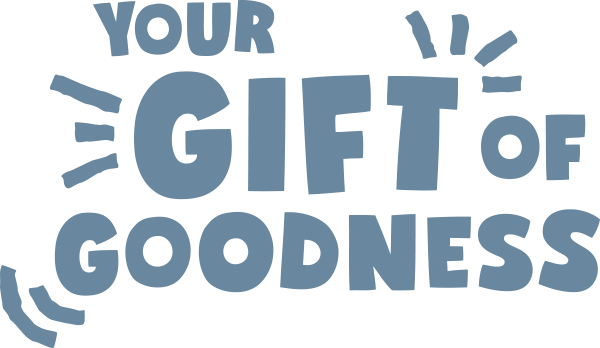 For your local Ambassador contact the Gift of Goodness campaign office on info@giftofgoodness.org. Please Note: It is important to include your schools unique reference number in your transfer so we can attribute the funds to you. If you have lost your schools unique reference code please email info@giftofgoodness.com.au to request it again. Children are asked to take the Gift of Goodness donation envelope home and when they bring back their donation it goes into the Donation Box. We already collect tins and gifts, how does this fit into the new Gift of Goodness campaign? CatholicCare is no longer collecting food for hampers as the cost of this exercise took money away from people in need and sometimes the food stuffs were out of date or inappropriate. When we asked our clients about whether they’d prefer the old or the new hamper they overwhelmingly preferred the more nutritious and varied Harris Farm Markets hamper. If your school has collected children’s Christmas gifts in the past and wants to continue this practice then email info@giftofgoodness.com.au and we’ll send you information about how to do this for Family Spirit’s foster care children. How does this work with the Vinnies Christmas collections? The Gift of Goodness campaign is not intended to replace the wonderful work the Vinnies Conferences do supporting people in need across Sydney. The Gift of Goodness campaign offers an opportunity for donors, in this busy day and age, to give cash rather than shop for donations. The people who receive the Hampers are amongst Sydney’s poorest and most disadvantaged. We encourage you to continue to support Vinnies in every way you can. Bringing in food is a tangible expression of Social Justice Actions. How can we replace this dimension and still support the Gift of Goodness campaign? Our Teacher Resources have been developed by Sydney Catholic Schools Teachers and they do a great job outlining how the Gift of Goodness campaign can be linked to Advent, the curriculum and Catholic Social Teaching. How can I get help or support with the Gift of Goodness Campaign? CatholicCare has a team who can present at your school and provide you with customised fundraising brochures. If you would like any support please contact the Gift of Goodness campaign office at info@giftofgoodness.org. Which causes does the Gift of Goodness campaign support? Click here to find out about the three causes the Gift of Goodness campaign supports. Our first priority with funds raised will be to distribute hampers to CatholicCare clients who are experiencing hardship this Christmas. Funds raised beyond those needed for hampers will be directed to the three programs: Family Recovery, Cultural Support and the all-important work of CCareline.